I made an enjoyable visit to this interesting and historical English city and county town a few days ago. Founded as long ago as AD 97 by the Romans under Emperor Nerva as Colonia Glevum Nervensis, it was granted its first charter in 1155 by King Henry II. It has a radical past in both its politics and its religion. In the English Civil Wars (1642–1651) it took the side of the Parliamentarians (Roundheads) against the Royalists (Cavaliers). It has been the home of Christian dissent and now boasts, for the city and the region, an excessively large number of churches; 159 of them. 1495-1500 – 1555) represents the theological battles going on during his lifetime, on both sides of the English Channel. 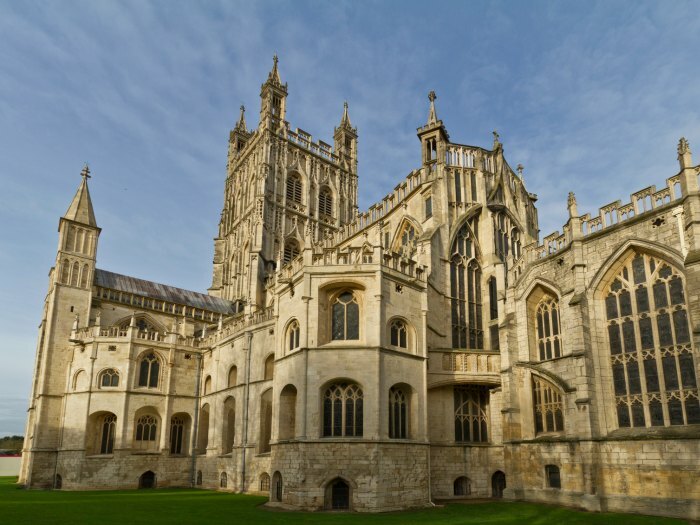 He had reformist views, tried to educate his clergy, lived simply and cared for the underprivileged and the poor, but was disapproved of by the Crown and the established church, and was executed by burning in Gloucester itself. His writing influenced the Puritan movement during the reign of Queen Elizabeth. The Anglican cathedral is magnificent with its enormous round pillars, many superb stained glass and numerous plaques and statues memorialising local worthies of whom the most imposing monument is the canopied shrine of King Edward II of England (1281-1327). He had a colourful life and in Berkley Castle an unfortunate death. He was murdered. (But to his credit he was the first King to establish colleges in Oxford and Cambridge!). I did the guided tour and was impressed but strangely not greatly moved, and I’m not sure why. I must visit again. I enjoyed the local Folk Museum, its emphasis on homes and customs including a wide variety of fishing tackle, appropriate for a town which has the distinction of being Britain’s most inland port. The River Seven, which defines so much of the area between East Wales and South West England, reaches right into the city. I tried to visit the Maritime Museum but I think its must be undergoing development. I walked around the Docks for a while, prevented from staying longer by a sudden wind that made walking difficult. Like so many towns in England during the present recession, there were empty shops in the high streets and much publicised sale offers. There wasn’t a buzz about the town but a relaxed everyday feeling about it. I had lunch in an African café, which was a surprise, and bought some local Double Gloucester cheese from the market, hard and tangy and very different from the mild variety that is normally on offer. A second visit is certainly required, and not just for the cheese!